Figs are marvelous. Dave and I have been eating them with duck confit (as in this spectacularly tasty recipe, all rich luscious duck and bright fresh figs with mustard seeds and curry leaves to perk everything up), pickling them, and just generally reveling in their availability lately. Comment #17 was randomly picked as the winner for the A Pig in Provence by Georgeanne Brennan book giveaway from Yummr. Congratulations, Michelle! Just get me your address and Yummr will ship the book directly to you. Wouldn’t it be interesting to create dishes and meals based on color palettes from Kris’s Color Stripes? Our occasional restaurant will be catering the VIP suite at SalonCon on September 13th. SalonCon is a one day event in NJ focusing on.. well.. check out their FAQ. Their tagline is “the Victorian Era for the 21st Century”. They have music, book readings, steampunk and neo-Victorian art, a ball, and a set of salons with speakers, suggested readings, and of course a lot of spirited discussion. If you can, please stop by to say hello, join in the event, and taste some of the tasty treats that we will be providing. Nancy Weber, an author, caterer, and all-around magnificently creative and wonderful woman, has started making these fantastic butcher’s aprons. The photo below is of me wearing mine while trimming lamb shanks (which we braised into melting tenderness using a adaptation of our Pomegranate Ginger Saffron Braised Lamb Neck recipe). I got mine when I saw it hanging in her apartment and fell in love with it on the spot. You can buy your own butcher’s apron here if you’re interested. Slice the cucumber into thin rounds, using a mandoline if you have one. Mix with a few tablespoons of salt, then set aside for at about an hour. Rinse the cucumber slices, squeeze them dry as you can, and set aside. Slice a baguette, and toast the slices is you like. Splash a bit of oil into a pan, then add some mustard seeds, some curry leaves, and some of the shredded duck confit. Cook over medium-high heat, stirring constantly, until the mustard seeds start to pop, the curry leaves start to sizzle, and the duck is warmed through. Slice the figs into 1/4″ thick rounds. 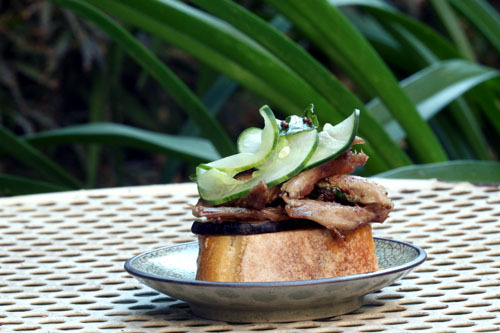 Put fig slices onto the baguette slices, then the duck confit with curry leaves and mustard seeds, then the cucumber slices. Garnish with an extra curry leaf. Take you some duck legs, and wings if you have them, and put them in a pot. Cover them with rendered duck fat and/or oil. Add the other ingredients. Cook for a couple of hours at a low simmer (the moisture in the duck will simmer; the oil won’t, of course), until the duck is very tender and easily pierced with a fork or even a toothpick. Remove the duck, cool and drain, then shred the meat. Delicious! That’s something I still have to try! One of the very few things I buy in cans here is duck confit…. It’s wonderful, and by the huge section in the markets, I’m not the only ‘French housewife’ that buys canned confit. Although, with this recipe I may try to make my own…. First: I wanted to say this awhile ago but hooray you are posting again and it was so nice to meet you at Elin’s! Second: this looks so delicious. As a recent convert to figs, I can think of no better way to serve up a new favorite than with duck confit, my old faithful love. Absolutly love lamb neck when braised. That apron looks really scary! Thanks for the duck confit idea – I’m making a big batch of duck confit this weekend and I will surely make this with some of it. Wow…the crostini looks gorgeous! And that apron made me do a double-take till I realized they’d been made like that;really cool. That looks delish ;) Fig and duck are so good together! There is a house a few blocks away that has a giant fig tree and it’s just packed with fruit. Every time I see it I think, I’ll just go knock on the door and ask if I can buy some. But then I chicken out. Fresh from the tree are so much better than what we get in the stores though, it just might be motivating enough to pay them a visit.